← 3 Hashtag Tips To Change Your Twitter from Drab to FAB! Every year, in the days after Thanksgiving, I open “the magic recipe folder” and start Christmas baking. I make 3 kinds of cookies, a couple different types of fudge, Russian Tea Cakes and mashed potato candy. When will you be making Almond Roca?? Many of my recipes have been handed down and I honestly don’t know how far back the Almond Roca goes – only that my grandmother passed the secret on to my mom, and she SUPPOSEDLY passed the secret to me. Southern California, where I live, is not exactly a baking mecca and I am famed far and wide for my Christmas baking. I get asked for my roca recipe all the time (not that it helps people when I give it to them) and, in the spirit of generosity, I’ll put my mother’s recipe below. The sad reality is, if you don’t know the lies secrets, you will have an epic fail on your hands trying it out. 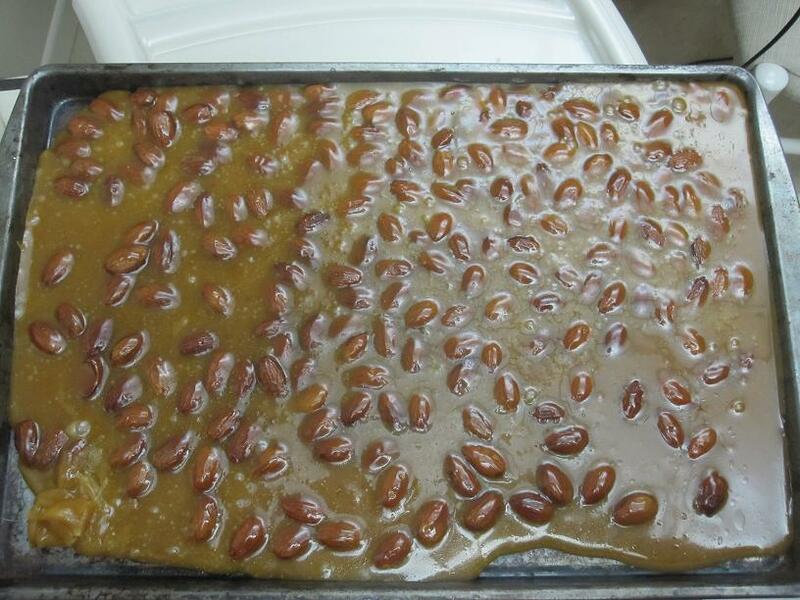 L: Your pan after you pour out the finished almond roca. R: Finished roca – before breaking into pieces (I use a knife or a sterilized icepick and hammer). 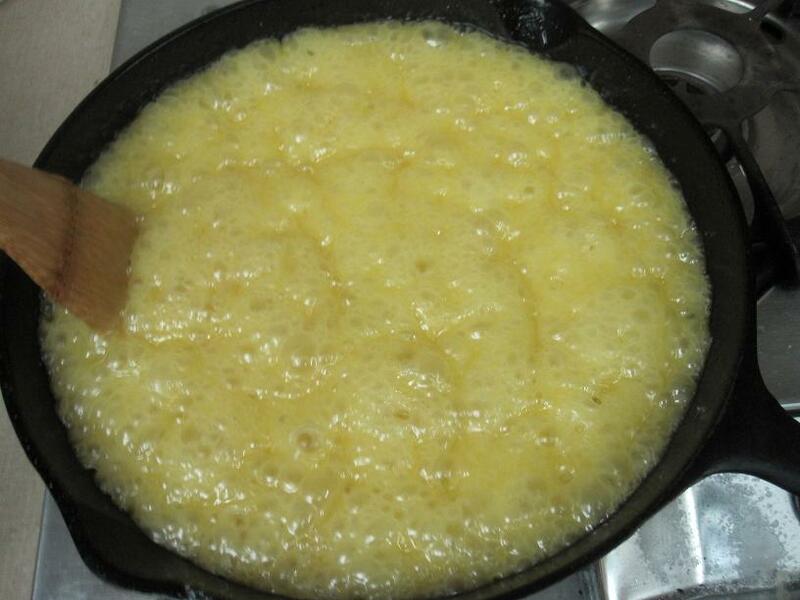 In heavy fry pan melt 1 lb butter, 2 ½ cup sugar. Cook & stir over highest heat until mixture foams vigorously. Cook and stir 5 min more over low heat. Stir over high heat until nuts begin to pop. Reduce heat & cook another 7 minutes. If mix darkens too much remove from heat but stir the full 7 mins. Pour in shallow 12×18 pan. Cool. Melt 1 ½ cups chocolate chips. Spread ½ over candy. Sprinkle with ¾ cup chopped walnuts or almonds. Cool. Flip over and do other side. Lie #1: You can’t make almond roca when it rains – it won’t set up. With the recipe above, this is absolutely true. I grew up watching the weather around Thanksgiving like a farmer (even though I lived in L.A.). My mom would say, “Jennifer, take a walk and let me know if we can make roca today.” We’d check the Weather Channel too, just to make sure an unexpected gale wasn’t on the way. Apparently when it rains, candy-making changes (unless you have a candy thermometer). Now do YOU see a candy thermometer in that recipe? Thasss right, you do not! I had to figure this all out myself one particularly rainy season. 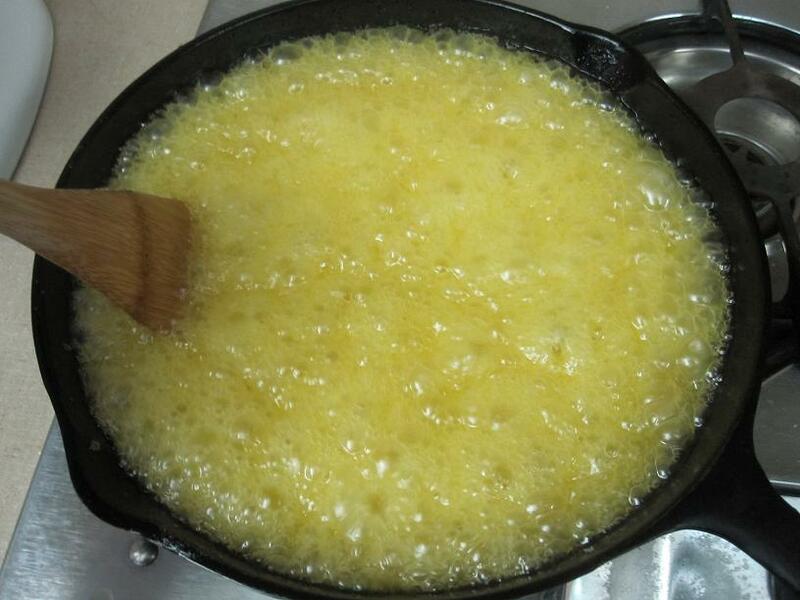 Lie #2: Just use 1 lb of butter – any butter will do. This “any butter” notion is deadly to almond roca. In all I tried FIVE different kinds of butter. Epic fails for every batch of roca I attempted. I started swapping out margarine…SEVEN different brands of margarine, to be exact. Not a one of them worked. Lie #3: Follow the recipe EXACTLY! There’s code words in this recipe. Seriously. For example: Cook & stir over highest heat until mixture foams vigorously. That last word is definitely meant to separate the wheat from the chaff in terms of the family bakers. This is what “foams” looks like. There is certainly a difference in feel but you’d have to have made it a gajillion times like me to know. You still need to have a cast iron pan, and you’d better use Parkay so you don’t cry, but if you print out this blog, you should have everything you need for the roca. I am virtually passing you the pan. Note: Just in case of bad candy-making juju in your kitchen, stock LOTS of alcoholic beverages…at least that’s what I do. Do you have these kinds of old family recipes? (You know, from before the candy thermometer or from the 4’2″ great-grandma who used “two handfuls of this and a dollop of that.”) Do you bake during the holidays? What’s your specialty? Enquiring minds love to know these things here at More Cowbell! For the month of November and December, I am part of the Holiday Yum Blog Hop where a group of uber bloggers will regale you with recipes and funny cooking stories. November 17: My Gluten-Free Thanksgiving Meal – it turned out fab! November 19: Kathy Owen’s Spiced Pecans – I sooo want to try these. November 26: Ellen M. Gregg’s Chocolatiest Chocolate Cake Evah – OMG! Stay tuned for link updates as posts go live and for more to be added to the schedule. 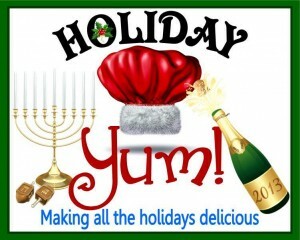 Be sure to check out our ever uberlicious host, Kathy Owen’s Holiday Yum page and leave her some blog hop love! Break out the bubbly…the holidays are HERE! 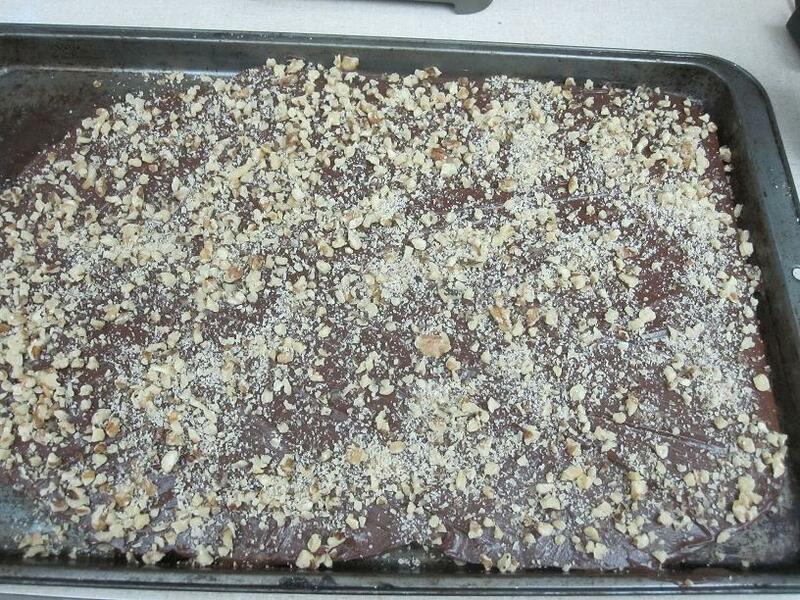 This entry was posted in Holidays, Recipes and tagged almond roca, baking, candymaking, Christmas, Holiday Yum, Jenny Hansen. Bookmark the permalink. Thank GOD you love me, and live close – and I’m able to wheedle some Roca out of you, because that recipe scares the crap out of me! OMG that sounds soooo utterly delicious and so utterly beyond my untrained and unskilled hands. I am shaking in my boots just thinking about keeping all the secrets straight…I mean, I literally blew up a meat pie AND set my hair on fire (and nearly my entire face) doing flambéed fruit for Mom’s bday once. I am not merely kitchen-challenged…I am debilitated. LOL! But this sounds soooooo tasty and ahhhhmazing….I wonder? I am off the week of Christmas. Maybe it’s time I venture into trying something totally new…LOL!! Thanks for sharing all the tips and tricks…luv it! Oh, Jenny! I laugh and think of you every time I even hear the name “Almond Roca.” I don’t know what part of this story is my favorite – passing the PAN, the 7 lbs of Parkay in your freezer, or the Roca weather report! Fabulous! All food traditions die here. If I can’t get it from the Market Street catering department, you won’t eat it on my holiday table. It’s their own fault! The year Christmas dinner moved to my house I got so much “help” that there were nearly murders in my kitchen. Now I pick up the big box from Market Street the day before and we enjoy a lovely prime rib and fixings without threats of death. My specialty is decorating the table anyway. Flowers, Christmas china, hand-embroidered Santa napkin rings, layers of table coverings, the family silver and glistening crystal make the meal out of this world. Chef Boyardee would seem like a feast at that table and we don’t have to invite the paramedics to eat with us. I will never think of almond roca the same again without visualizing the pan, the foaming, the cracking … oh my! H-O-W-L-I-N-G over your story about the passing of the pan, Jenny. Only you. I signed in thinking, “Okay! So! I’ll see a list of ingredients and 1,2,3 instructions. Sounds yummy. Might be worth a try.” And, guess what? It would be cheaper (and, more fun) to fly to Cali to watch you make this for me. What is it with seven minutes? I am now the official maker of Fudge Squares in the family. It’s a thin chocolate cake (easy) topped with a fudge mixture that must be poured onto the cake at exactly the right time and temp or it will either (1) become fudge-stew-on-a-cake, or (2) crystallize (the kiss of death). The recipe calls for the fudge to be brought to a rolling boil and cooked for precisely seven minutes. Before I killed my husband When my husband was still permitted in the kitchen while cooking this, he used to set the timer and despite my fudge-a-holic knowledge to the contrary, he insisted I take the mixture from the heat at precisely seven minutes. This resulted in seven — yep, the magic seven again — failed attempts hitting our in-home version of a Dumpster the first year I made this family traditional treat. I now use the candy thermometer to bring the mixture to soft ball stage and it works like a charm. My MIL had OLEO on all her recipes. So far, so good on using real butter instead. Do not jinx me. I don’t know what the deal is with the flippin’ 7 minutes, but it must be how long it takes for butter and sugar to truly “candy up.” It definitely changes with weather though, which is weird. I’d still be making it the old way (where only 70% of my batches each year came out) if one of my friends hadn’t worked at a culinary school. The bakers there told her to get me a candy thermometer and explained all the soft crack/hard crack business. Just give me a good excuse, Jenny. We’re talking creative gotta-spend-money-and-go-to-California-without-you-honey creative sneakiness here. Put together my own conference package, including an invitation to an exclusive awards banquet. I will, of course, be the featured speaker. Woot! California in 2013! Done deal. My Mom would never make divinity at Christmas if the weather wasn’t right. If she did, it never came out right. I can’t make divinity even if the weather is right but I’ve had spectacular failures. Even though I have a cookbook that goes back to my great-grandmother, I learned mostly from watching my great-aunts, grandmother and mother and then trying baking and candy making under their watchful eyes. Recipes were mostly guidelines to them – they went more by look and feel, and I still can’t get anything to come out right trying to use a candy thermometer. Whatever works! Yep, that’s the way candy works (at least before the advent of the candy thermometer). Although I think Divinity my be iffy regardless. I have a recipe somewhere. I’ll have to check. Oh, yum. Thanks for sharing that. My great-grandmother made the most divine divinity. She made a batch with nuts and anther without. We would eat it with a spoon before it hardened. I have not tried to reproduce it. Other family members have tried and failed. So sad. She also made the most incredible homemade vanilla ice cream–it was better than Blue Bell’s (which is saying a lot considering my family didn’t eat any other kind of ice cream). My brother found that recipe and has reproduced it. Yum. You speak truth about old recipes! You can’t make divinity when its too humid, too, even with a candy thermometer (or so I’ve been told). I grew up in Northern Wyoming, where humidity was not often a problem. (grin) I also learned to make homemade bread w/o a recipe or humidity. since moving south, I make bread bricks, not loaves and have given up. My mom taught me to knead bread by how the dough felt…. Ahhhh, it’s that time of the year when I excessively cook, bake, and try to be merry, haha! Thank you for a wonderful recipe. Yummmmm! Your pictures are fabulous – it takes a lot of self-control not to lick my phone screen, lol. Your first knuckle… *snort* I know they weren’t translating the whole “what if this bowl breaks thing” but DANG. Why do they have to make it so hard?? Well, I was goona make me up a batch, but I can’t use cast iron on my ceramic cooktop (or so I’m told) so I shall have to pass. I do have a handy dandy candy thermomator though. And I know where I can get Parkay. So I’m armed but not able. Fabulous! 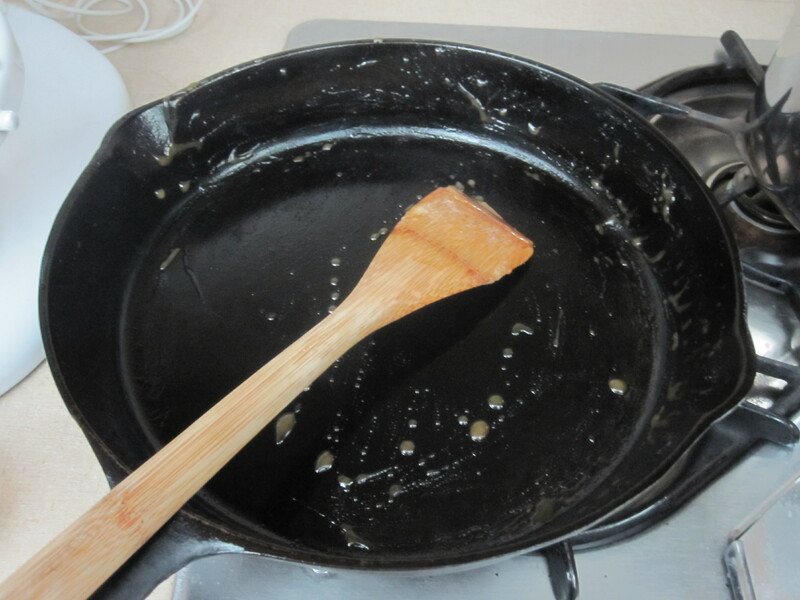 I happen to have a perfectly seasoned cast iron skillet, but the question is this: Where’s the Parkay? I don’t recall the last time I saw it in the supermarket. p.s. Those doughnuts sound FAB!!! The holiday blog hop looks fab, and so does the Almond Roca, but I’m leaving it to you. I went through a candy making phase in junior hi and I’m pretty much over it now. But you can send some to me, if you have any left! I’ll stick with the cookie press cookies handed down. For that you have to use butter. Much easier to find than Parkay, although I bet we have Parkay here. I’ll have to look and see, Maybe not in Boulder, but if you drive North and East you can still find farms and ranches with home cooks in the kitchen and a lack of whole foods. They allow real sugar there too! I began reading about your almond roca thinking *hmm- I just might try that this year* but by the time I got to the end I was thinking *no can do*. After pouring a glass of wine and reconsidering, I came back here and printed your post, e-mailed it to my granddaughters and announced this would be our featured challenge at our annual holiday baking day in two weeks’ time. I’ll keep you posted! Love this blog hop, ladies! Great idea! Jenny, I am put this comment in several places hoping you’ll get it. You are being shadowed by someone with the handle cartyuc6. I suggest you change your password very, very fast. The last tweet you sent to me was copied by them. I have blocked them as they look suspicious. Cheers. Ooh…roca looks really yummy! Alas, I will not be making it, because my kids are pains in the neck and don’t like almonds. They don’t like coconut either, which is pretty rude in my opinion. If I make anything with any of those ingredients, I wind up with three choices…eat it all myself, give most of it away, or throw it away. So I usually just do without. Thank God Bob Evans makes decent coconut cream pie, for when I seriously need a piece (and I’ve said the heck with it…I NEED SOMETHING WITH GLUTEN!). I have a few kitchen disasters. The time the boiled eggs exploded was probably the worst, but not legendary like my chicken stew with cauliflower. I have always liked to experiment in the kitchen, and will never forget how my dad, after RELUCTANTLY trying my salisbury steak said, with an expression of awed wonder, that it actually tasted good. It was almost pitiful how scared he was to take that first bite. I’ve learned a lot since I was a teenager though, and most of the experiments turn out pretty well now. My specialty at Christmas is a Pillsbury white cake mix, made in round pans, and cut into four layers. On three of those layers, I spread cooked, cooled Jello vanilla pudding, then I frost the whole thing with sweetened whipping cream, and pour a can of cherry pie filling over the top. It’s easy, it looks festive…and it tastes wonderful.